Influential Los Angeles punk band, The Germs was formed by Darby Crash and Pat Smear after they were kicked out of their Scientology high school for convincing a large number of students that they actually were God and Jesus. 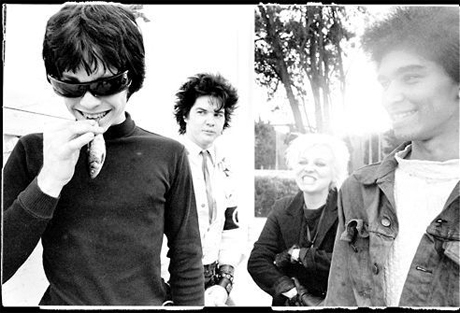 Over just a few years until Crash’s suicide in 1980, a number of female musicians were associated with him. Whilst Crash (born Jan Paul Beahm) comes across as your typical narcissist, he was undoubtedly a complex character. It is now generally accepted that he was gay, but afraid to come out for fear of losing his fans. For Penelope Spheeris’ documentary on the LA punk scene Decline Of The Western Civilisation Part I, he moved his male lover out and drafted in an old female friend to pose as his girlfriend . 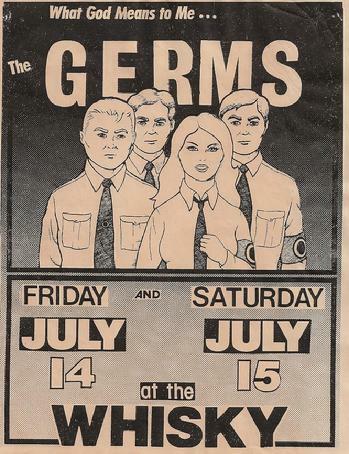 In 1976, when The Germs first formed, they were a 2-boy, 2-girl band. Original bass player Diana ‘Dinky’ Grant and Michelle Baer on drums rehearsed, but never played in front of an audience. In 1976, Teresa ‘Lorna Doom’ Ryan took over on bass, with Belinda ‘Dotty Danger’ Carlisle on drums. Glandular fever struck, and so Donna ‘Becky Barton’ Rhia took over to play drums for the recording of the Germs’ first single and three gigs. Instead, she remained a helper for The Germs whilst pursuing her own new band The GoGos. The scientology background, the hard drugs and struggle with accepting his sexuality go with Darby Crash’s depressive, artistic temperament to explain why the thought of suicide formed part of his everyday conversations with other people. What is of particular interest to us, is the role that the women around him played. It seems clear that Crash had a coterie of girls, who were not sexual partners, but who looked after him, fetched things, paid for his food, drink and drugs. One of these was Casey ‘Cola’ Hopkins. She describes a drug-fuelled existence in which suicide was a common theme, both to end the pain and to achieve fame. Since the 1980 suicide pact that Hopkins survived, many rumours have persisted about how, why and whether either of them really ‘meant it’. If Darby Crash had hoped to attain fame via a rock ‘n’ roll suicide, the timing was ill-judged because less than 24 hours later, John Lennon was shot and a dead punk junkie wasn’t newsworthy in comparison. Thirty-eight years on, what have we learned? Females serving narcissistic damaged men = Have we moved on from this one?? ?